Stephanie Anderson defended her dissertation in June. Her committee included, from left, Melony Shemberger, Teresa Clark, Anderson, and Robert McGaughey. She completed her doctorate in August. 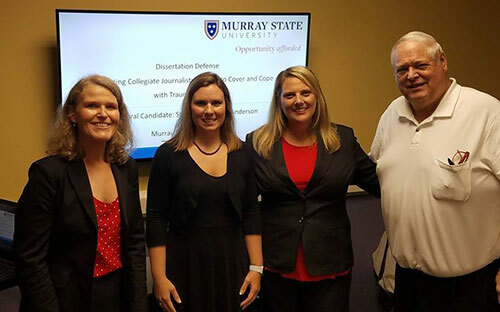 Dr. Stephanie Anderson has joined the JMC department as an assistant professor in the journalism sequence and advisor for The Murray State News. 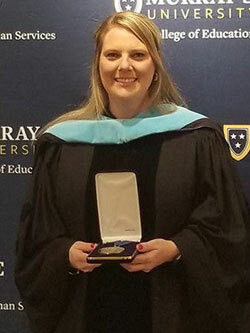 Anderson received all three of her degrees from Murray State. She earned her bachelor’s in electronic journalism in 2004 and her master’s in mass communications in 2008. She recently completed her doctorate of education in August 2017. Anderson was a member of the inaugural cohort of the College of Education and Services’ P20 and community leadership doctoral program. This is the second doctoral program offered at Murray State. Anderson specializes in the area of trauma journalism. Her dissertation topic, How to educate collegiate journalists to cover and cope with traumatic events, has already been integrated into her JMC 398 Reporting for Broadcast and Online Media course. She will present her findings at the Kentucky Press Association conference as well as the Broadcast Education Association’s national conference in 2018. After working in television news in Paducah and Albuquerque as a producer and assignment editor, she transitioned to public relations in the casino entertainment and non-profit industries. Before beginning her career in academia, she worked in advertising sales for newspapers and magazines in Illinois and Kentucky. Anderson began teaching as an adjunct in the JMC department in 2010, teaching at the Paducah campus as well as the main campus. She is a lifelong member of Alpha Omicron Pi sorority and currently serves as the communications advisor. She was the recipient of the L.J. Horton Journalism Scholarship, which is what originally brought her to Murray State in 2000. In 2015, she was awarded the Vincent T. Wasilewski Award from the Broadcast Education Association. She is married to Robert Anderson and has two stepchildren. Categorized | Alumni, Faculty/Staff, JMC Dept.